The English Springer Spaniel is well known for its hunt and retrieve abilities. An excellent group of names can be drawn from this traditional history of the breed. These dogs are known for exhibiting a hunting behavior of springing forth to flush game into the air. Names like Spring, Bound, and Buck are popular due to this characteristic action. Being one of the fastest of the Spaniels, many owners turn towards speed or quickness related names. 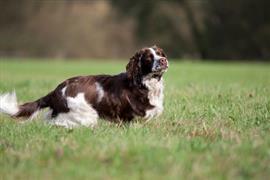 Many of the English Springer Spaniels today are show dogs. The show-bred lines tend to have longer fur and weigh more. A majority of show-bred owners tend to pass names along from generation to generation. It is always a good thought to consider the parent's names as an option. Some of our pages will contain a subcategory. A subcategory is a slightly more specific grouping than the main topic of the page. For a subcategory, we will include a separated table of names and corresponding descriptions. An example of a subcategory of Red Dog Names would be 'Dog Names Inspired by Red Wines'. If you have any subcategory ideas for the English Springer Spaniel Names page, we would love to hear them. Use the form below to submit your ideas.